The Arkon Mega Grip cradle has been around for many years. It remains one of my favorites and in fact, this is one of the mounts that I use regularly for my Apple iPhone 6s Plus. There’s a lot top like about this holder. Unlike most expandable cradles, this opens with a button on the side. It’s one of the few cradles that can be operated with one hand. Press the button and the arms on both sides snap open. The cradle is well made and can be easily closed around the device by simply pressing the sides against the phone. The Arkon Mega Grip holder features expandable sides that open to 3.4 inches. The sides are padded to ensure that your device doesn’t scratch. The opening dimensions enable this cradle to hold some large devices. That includes my Apple iPhone 6s Plus with a big thick Otterbox Defender case. I have also recommended this for devices other than phones as illustrated in our Blink Home Security Camera Mount article. The bottom of the cradle has a pair of support arms that can move from side to side. That’s handy when accessing the ports at the bottom of the phone. The support arms can be removed completely or even moved to the top of the cradle in case you need to use it in a different orientation. The back of the Arkon Mega Grip cradle has dual slots in a mounting pattern known as the dual T. These two slots match up perfectly to Arkon’s dual T mounts. That means the Arkon Mega Grip cradle can be paired with a multitude of mounting solutions available. These holders are often paired with vehicle and handlebar mounts for use in cars, motorcycles and bicycles. I have always found that the best way to buy a mount is to first measure your device then choose the cradle. Find the cradle paired with a mount as cradle and mount combination kits will yield the lowest cost versus buying the parts separately. Buying the cradle and mount as a kit also ensures compatibility since the manufacturer has purposely paired them together. So let’s look at a few of the most common mounting kits that feature the Arkon Mega Grip holder. Everything comes with a two-year manufacturer warranty. I mentioned at the beginning that I use this holder regularly for my iPhone 6s Plus. It’s paired with a suction cup mount. The mount that I use is the Arkon MegaGrip Suction Cup Windshield and Dash Mount. The mount features a vacuum locking suction cup assembly. This is attached to a pivoting arm. The Arkon Mega Grip cradle can swivel into any orientation. The mount also comes with an adhesive disk that adheres to the dash which allows the mount to be attached to a car dash. The suction assembly will adhere to the adhesive disk just like it would on a windshield. I have used this since my original iPhone 3G many years ago. I like this mount a lot. How about the mount that’s featured in the photo that accompanies this article? 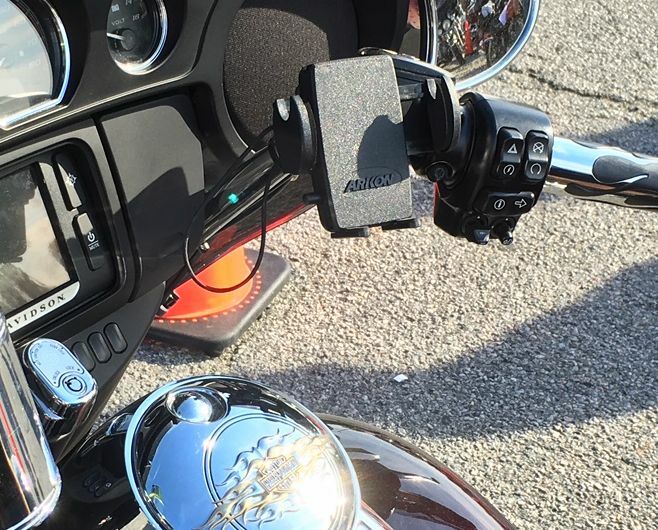 That’s the Arkon MegaGrip Smartphone Handlebar Mount. Arkon combines this mount with a safety strap for added security along with a good quality handlebar mount that fits up to 1.25 inch diameter bars. The mount includes a rubber strip that will enable the mount to be used for smaller diameter handlebars. The third mount featuring the Arkon Mega Grip holder that qualifies as one of my favorites is the Arkon MegaGrip SmartPhone Vent Mount. This is a great mount for placing your phone on the air vent. This mount couples a vent mount with the Arkon Mega Grip cradle. It will attach to your vent slats using a pair of arms that grab onto the slats. I find the mount works best in cars with horizontal vents. It places the device near the eye level of the driver yet it’s not as visible as a windshield mount so it stays out of the view of potential thieves. These are great solutions for those living in those states where windshield mounting is not allowed. The Arkon Mega Grip cradle is one of those holders that are truly universal. If my Apple iPhone 6s Plus with a thick case can fit, I feel fairly confident that it will fit my future phones as I can’t imagine phones getting any larger than this.